Welcome to Archontiko Stathopoulou “One of the top 25 villa-hideaways of the world that have all the comforts of a hotel” according to Conde Nast Traveller Magazine. 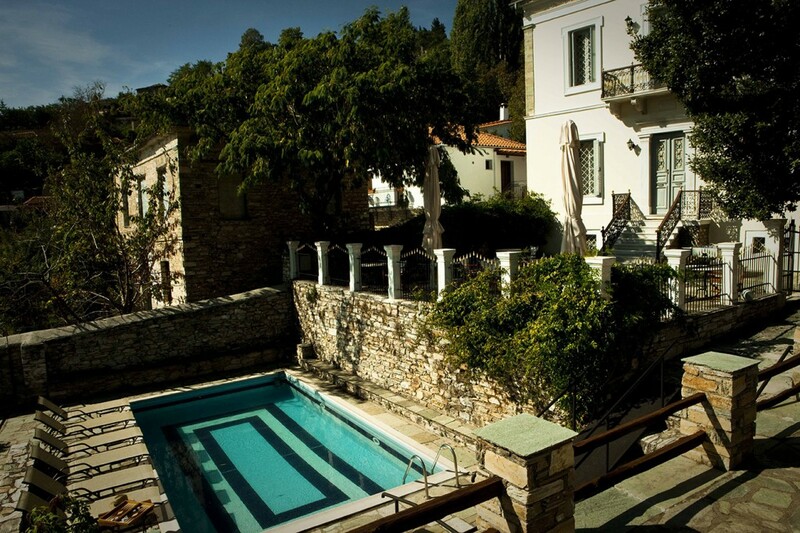 Archontiko Stathopoulou is one of the oldest and most remarkable Neoclassical Pelion mansions with a unique history. It was built in 1888 by local trader Ioannidis when he returned rich from Egypt to the village of Agios-Georgios, one of the largest villages of Pelion at that time. It is said that Ioannidis was so rich that he was carried over onto a throne to avoid walking. The mansion year after year collapsed and although ruined it was declared in 1986 from the Ministry of Culture as a “Work of Art”. A few years after, it was exceptionally restored by the new owner civil engineer K. Stathopoulos, preserving its unique 19th century character in every detail, and has turned into a high standards luxury boutique hotel. The position of the mansion is unique, enjoying breathtaking views both to the village and to the sea of Pagasitikos gulf. The characteristic ornaments of the mansion are the painted high ceilings, creations of great artists brought together by Ioannidis from Egypt as well as the famous local painter Kasdasis. You can choose between 6 double or triple rooms in the main building with painted high ceilings and 4 private traditional stone bungalows in the garden with panoramic view. Designed and restored in perfection, combining traditional architecture with modern facilities, our mansion features all the comfort you need. Cable tv, free wifi, anatomic double beds, branded natural products of personal care, modern bathrooms and much more. We serve homemade traditional Greek breakfast at our warm and cosy breakfast area next to the fireplace and for the rest of the day you can choose to relax and taste our local delicacies and drinks between our beautiful 1st floor Hermes lounge and the outdoor area where there is a peaceful big garden with a swimming pool and amazing view. Retreat to the authentic elegance of our mansion and live a unique experience!